I should be on a plane headed home from New York City; instead, I’ve spent the day here. 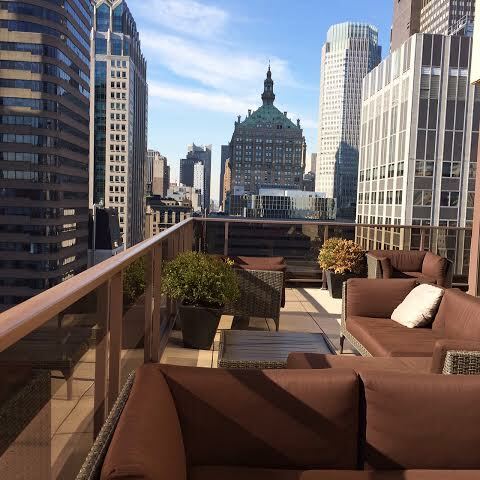 All by myself in a rooftop haven overlooking Manhattan – just me, the blue sky, and the city below. I’m pretty sure this is where angels go to have a good time. Brad gave me the gift of a long weekend here with my dear friend Lori Portka as a 40th birthday present. At the time, we had no idea the timing would coincide with our launch of Infinite Purpose. Our time here has been filled with little miracles, and so much excitement as people kept signing up and connecting with one another. We are so, so grateful. This morning, when I checked on my flight status, the airline recommended I change my flight because it would likely be cancelled due to the snow storm in Minneapolis. They would change it for free, but not cover my night in New York. The room we’d been staying in was already booked for tonight, and to book another would have cost a small fortune. I chose not to panic, and asked the angels to help coordinate whatever was meant to be. My dear hubby jumped into action while getting the kids ready for school back home. He called his parents, who quickly found me another hotel using loyalty points – awesome! And then the nice man at the front desk suggested I store my luggage with him and spend the morning in their VIP lounge. When the elevator doors opened to the 33rd floor, I gasped. It opened out to this glorious rooftop terrace, which I had to myself for as long as I wanted. What!? Had I flipped out at the news of my flights being cancelled, I’m not sure the same thing would have happened. I believe – and see proof time and time again – that when I allow a situation to unfold as it’s meant to, rather than try to control every little detail, magic happens – and the view’s amazing.